COMPASSION: During World War I, Eleanor served in the American Red Cross to aid relief efforts. 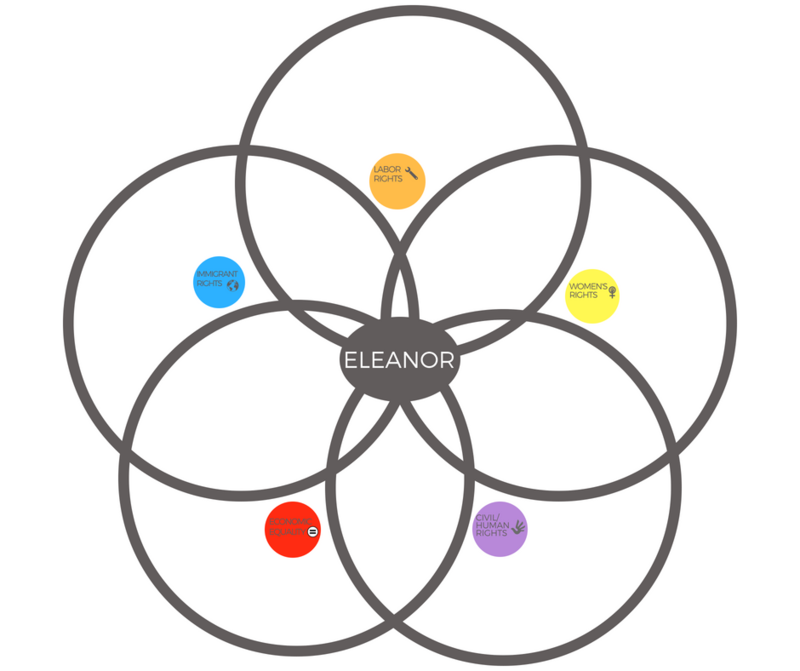 COLLABORATION: Eleanor served with the United Nations for six years after her husband’s death. RESPECT: Writing the Universal Declaration of Human Rights was no small feat, and it took an enormous amount of respect for people. At that time, social hierarchies were very strong. For example, men were given the most opportunities, and women, working-class people, people of color, and immigrants were often seen as less important – or sometimes, not important at all. Writing the Declaration of Human Rights helped people understand that everybody, no matter their circumstances, has the right to dignity, safety and opportunity. Eleanor considered this project to be the most important accomplishment of her life. Eleanor Roosevelt was born on October 11, 1884 in New York City to a family of high society people. This meant that people around her had money and influence. For example, her uncle was Theodore Roosevelt, who was a former U.S. President. As a girl she was shy and serious. Both of her parents and a little brother passed by the time she was ten years old. She grew up with her grandmother, and she tried to help raising her other younger brother. Even though Eleanor was young, she suffered from depression as a result of the losses and responsibility. In 1905, Eleanor married Franklin Roosevelt, her distant cousin. He was also a politician like her Uncle Theodore. They had six children, though one passed away from childhood disease. Franklin worked hard, and so did Eleanor. She joined the American Red Cross during World War I, and soon she had to care for Franklin, who suffered a polio attack and became paralyzed in his legs. Despite the couple’s challenges, they persevered. In 1933, Franklin was elected as President of the United States. Eleanor, who was now the First Lady, took advantage of this opportunity. Unlike other First Ladies, Eleanor did not only want to attend parties and take care of the house. She used her political position to enact changes that would create social change in the United States for decades after her time. She spoke out about human rights, children’s rights, economic equality, and women’s issues. Franklin Roosevelt was a very popular president, and the country elected him four times. However, in 1945 he passed away, and another president – Harry S. Truman – replaced him. 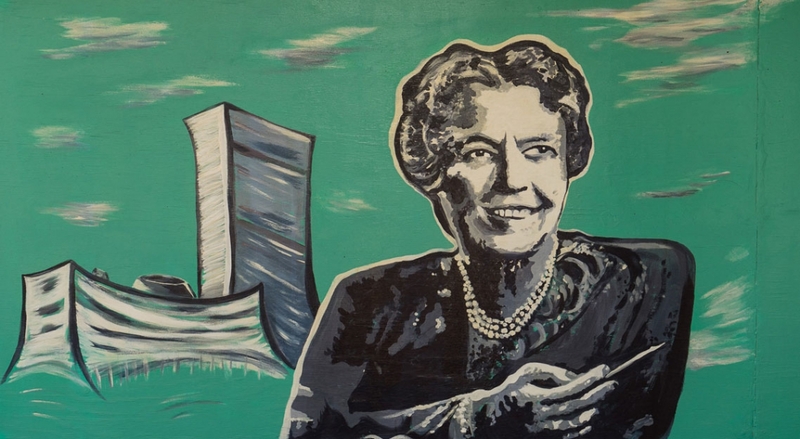 Even though she was no longer the First Lady, Eleanor continued to work for human rights. Truman appointed her to The United Nations, which is a group of representatives from many nations across the world who promote cooperation, diplomacy, and problem solving. Specifically, Eleanor worked as Chair of the Human Rights Commission, and she eventually wrote the Universal Declaration of Human Rights. Eleanor stayed involved in The United Nations all the way until her death in 1962. She wrote many books about her life, and she will be remembered for her legacy of ambition, political engagement, and compassion. U.S. II Standard 1.2: Students will explain the connections between the growth of industry, mining, and agriculture and the movement of people into and within the United States. U.S. II Standard 1.3: Students will analyze the causal relationships between industrialization and the challenges faced by the growing working classes in urban settings. U.S. II Standard 2.1: Students will use primary and secondary sources to identify and explain the conditions that led to the rise of reform movements, such as organized labor, suffrage, and temperance. U.S. II Standard 2.2: Students will explain how social reform movements influenced Constitutional amendments and changes to laws and democratic processes. U.S. II Standard 2.3: Students will evaluate the methods reformers used to bring about change, such as imagery, unions, associations, writings, ballot initiatives, recalls, and referendums. Objective: Students will listen to and read a historical poem and consider how meaning changes over time and in different political contexts. They will reflect on what landmarks represent their values, as well as the values of their country. They will define what “America” means to them, then design a symbol in the form of a statue to represent this definition. Hand out copies of the poem for students. Have them read it, first to themselves, then out loud with a partner. What words or phrases do you like the most? What questions do you have? In her speech, Eleanor describes Emma Lazarus’s poem as a “prayer.” Why do you think it was a prayer to her? Places (Disneyland, Broadway, Great Lakes, Las Vegas. Allow time for students to discuss, then share answers and questions with the class. Answer any questions appropriately so that they understand the context and meaning of the poem. Tell students, at the time that The Statue of Liberty was given to the United States, people had different opinions about it. Some people thought she did not look like an “American” because of the gown she wears, which looks like a Greek robe. Others loved her and thought of her as a goddess-like mother figure who welcomes and protects immigrants. Mark Twain, a famous poet at the time, thought the statue was too much like a queen, and that a true “American” statue would look like a working-class person wearing tattered clothes. Emma Lazarus was not the only poet to write about The Statue of Liberty, but it was her poem that was chosen to be placed on its plaque. Why do you think it was Lazarus’s poem that was chosen during the late 1800s, a time of great immigration? Does The Statue of Liberty seem American to you? If you were to design a statue that symbolizes welcome to all immigrants and Americans, what would it look like? Next, put students into pairs, and have them design a statute to symbolize welcome, inclusivity, and their definition of “America.” Let them be creative with colored pencils, markers, and crayons. After the lesson, allow time for each group to share and explain their “new” statues of liberty. Have students write a poem in honor of their statues. Give students 3D materials and let them sculpt or build their statues in real-life. Show students “Who Named America?” and ask them to come up with their own name for the USA & write an essay to explain why. Introduce students to the poet Richard Blanco, another immigrant artist from Cuba whose poem was read for Obama’s inauguration. Ask them to write a poem about what America means to them.